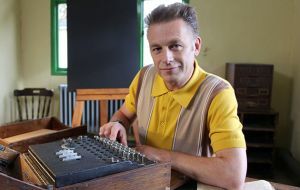 Wildlife expert, naturalist, photographer, painter, campaigner and self-confessed punk rocker, Chris Packham delightfully defies categorisation. From his outspoken views on wildlife to his 2017 documentary about his experiences of autism, Chris is not afraid to make headlines. And the BBC presenter has been back in the news again recently after being awarded a CBE for services to nature conservation in the New Year honours list. The tireless environmental activist makes a welcome return to our screens next week, as part of BBC2’s popular nature series Winterwatch, with Michaela Strachan and Gillian Burke. Congratulations on your CBE. How should we address you now you’re a Commander of the British Empire? What’s new about this year’s Winterwatch? What is happening in the Cairngorms right now? What other issues are you exploring? You’re refreshingly honest about your autism and health. Is it difficult having the personal and private made public? CP: “No, I’m very fortunate that I’ve a small voice to affect positive change. Of course sometimes it’s uncomfortable, but only by being candid and truthful can I help other people. “I still worry about all those kids who, like me aged 18, are sat in their bedrooms listening to The Smiths and thinking about killing themselves. These are creative, able, good people who have the capacity to grow. We have to make sure we can give them the foundation to do that. Winterwatch is airing on BBC2 next week. The post Chris Packham: Nature therapy works for mental health appeared first on What' s on TV.